Very little is known of the earliest Aztecs, they did not keep a written record. Their history was passed on by word of mouth from one generation to the next. Legend has it that they came from an Island called Aztlán, meaning "White Place" or "Place or Herons". In the Aztec codex "Tira de la Peregrinación," commonly called the "Migration Scrolls." The scrolls have the Aztecs leaving Aztlán, which was described as an island in a lake with Chicomoztoc depicted as seven temples in the center of the island. The Aztecs felt they were the "chosen people" of Huitzilopochtli. The Aztecs believed Huitzilopochtli their war god was their protector, how had them search for their "promised land." Sometime during the 12th & 13th century the Aztecs straggled into the Valley of Mexico, led by their chieftain Tenoch. They were a poor, ragged people who survived on vermin, snakes, and stolen food. They were hatred and rejected by all the surrounding inhabitants of the valley, for their barbarous and uncultured habits. They were driven from one location to another. Early in the 14th century, Huitzilopochtli told Tenoch to lead his people to a place of refuge on a swampy island in Lake Texcoco. When they reached their destination, they were to look for an eagle perched on a cactus, growing from a rock or cave surrounded by water. At that location, they were to build their city and honor Huitzilopochtli with human sacrifices. 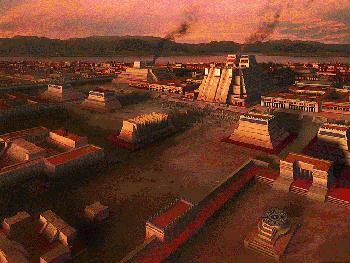 The city they built was called Tenochtitlán, the city of Tenoch. In the beginning stages of Tenochtitlán, development, Aztec life was very difficult in their undesirable location. 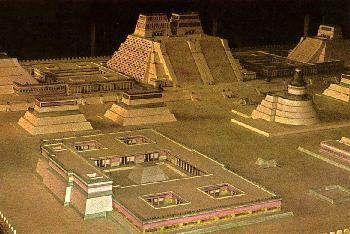 Tenochtitlán was located on a marshy island with limited resources, they built a few thatch and mud huts, and some small temples. The Aztecs would have to work constantly to maintain a city on swampy land. There was also continuing tensions between the Aztecs and the neighboring peoples on the mainland who despised them. Despite these obstacles, the Aztecs worked hard to improve the quality of their lives. They adopted an agricultural system of farming called the Chinampas. and in a short period of time, the land was transformed into a fertile and highly productive island. As the Aztec empire expanded, specialized craftsmen and common laborers were brought to Tenochtitlán to expand the city. Since it was built on swamp land, large wooden stakes were driven into the soft ground to provide secure foundations for the new buildings. They were able to use the stone Tezontli to construct the buildings on the unstable ground. Despite these precautions, the larger temples and palaces would often sink below ground level. As a result, the older building were continuously repaired or rebuilt with the newer structures built over the older core. By 1376, the Aztecs knew that they had to select a emperor of royal lineage, to gain respect of their neighbors. With political genius, they chose a man by the name of Acamapichtli as their emperor. He was related to the last rulers of Culhuacán, and his lineage extended back in time to the great Toltec ruler Quetzalcóatl. With the selection of Acamapichtli as the Aztecs first true emperor, their were able to claim descendency from the great Toltecs. During the 15th century the military strength of the Aztecs increased. They grew from a small tribe of mercenaries into a powerful and highly disciplined military force. They also formed alliances with their powerful neighbors Texcoco and Tacuba, known as the Triple Alliance. 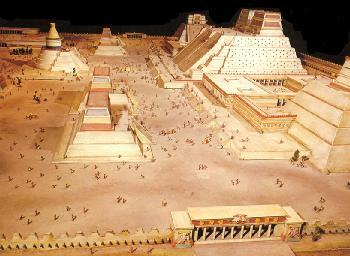 It was a time for building and the city Tenochtitlán grow and prosperd.